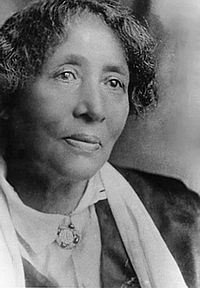 A staunch fighter for militant industrial unionism, full equality of women, and an end to racial discrimination, Lucy Parsons is a major figure in Chicago and U.S. Labor history. She was born Lucy Gonzales in Johnson County, Texas and was of African-American, Mexican, and Native American ancestry. She and her husband, Albert Parsons (of the Haymarket Eight), met in Texas and later moved to Chicago in 1873. They became active in many labor and civil rights causes, and joined the Socialist Labor Party in 1877. Lucy was an active publicist for the cause of socialism, and later anarchism. She was a leading writer for The Alarm and an excellent public speaker. She and Albert were leaders of the "Poor People's March" in 1884 to protest hunger and homelessness, and led the May 1, 1886 march of over the 80,000 workers who were demanding an 8-hour day. When Albert and the other Haymarket activists were arrested, Lucy made a cross-country speaking tour to enlist support for their release. After Albert's execution, Lucy remained in the thick of the struggle for social justice and equality. She was a founding member of the IWW in 1905. On January 17, 1915 Lucy led an 'Unemployed Parade' up Halsted Street in front of the Hull House, where a new song was sung: "Solidarity Forever." Lucy was a familiar sight at every major workers' march and rally in the 1930's and early 1940's. For the last 15 years of her life she was a member of the CPUSA. From 1910 to the time of her death, Lucy Parsons lived with activist George Markstall. In 1942, her house caught fire and she perished in the blaze. 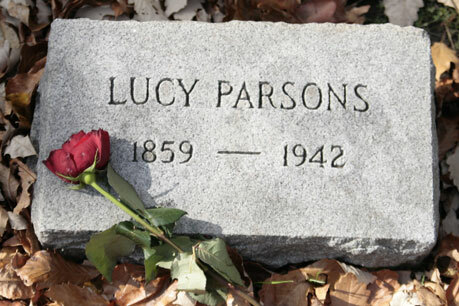 Markstall's ashes along with those of Albert Parsons, Jr. (son) are interred in the grave of Lucy Parsons.